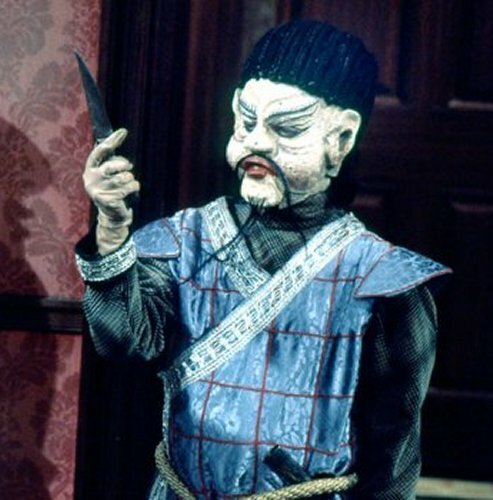 The Talons of Weng-Chiang was one of the most well-regarded classic Doctor Who stories. A pastiche of Victorian crime tales, it had the 4th Doctor in Sherlock Holmes mode (complete with deerstalker) in pursuit of a Ripper-like murderer of young women. However, what I found most intriguing about the script was not so much its spot-on depiction of fog-shrouded London, but rather its brief evocation of far future Earth. The titular villain turned out to be Magnus Greel, a war criminal from the 51st Century who fled in a faulty time cabinet. The journey distorted his DNA, forcing him to drain the life essence of his victims to maintain his twisted existence. In recounting Greel’s backstory, the Doctor made reference to having been “with the Filipino Army at the final advance on Reykjavik.” The Filipinos’ role in a war to determine to fate of Iceland–Iceland!–was left to viewers’ imaginations. Played by Deep Roy–who has one of the best stage names ever–Mr. Sin was a cyborg better known as the Peking Homunculus, a sinister creation whose sole organic component was the cerebral cortex of a pig. And every once in a while, the swine took over. It turned out that pigs think an awful lot about killing all humans. Left at the controls of a laser cannon, Mr. Sin began blasting away at friend and foe alike, snorting all the while. Shudder.